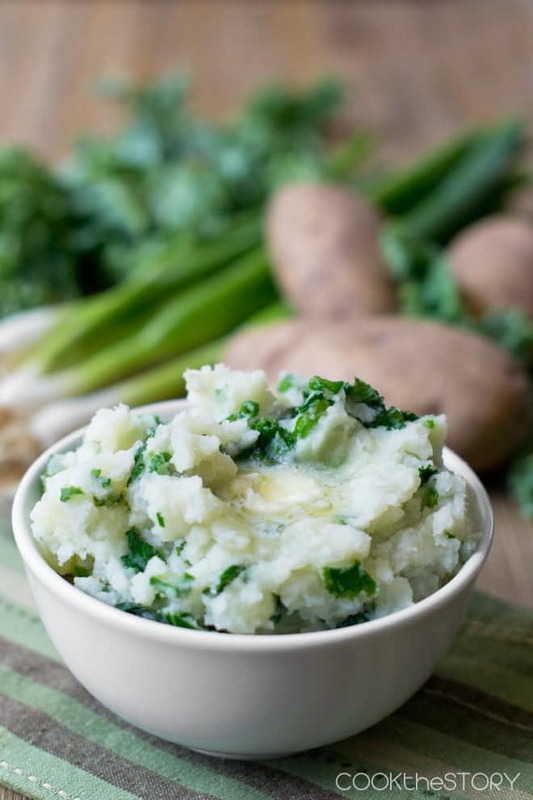 Colcannon is an Irish dish made by mixing mashed potatoes with kale. And lots of butter. I put even more butter on top. Try this for St. Patrick’s Day. My son doesn’t like potatoes. Not even french fries. The only way I can get him to eat them is if I mash them up and shape them into snowmen. And, oddly enough, he’ll eat potatoes if I mix them with kale and call it Colcannon. But it’s not because of the kale. Nope. It’s because of the butter. Look at it melting there on top of those potatoes. 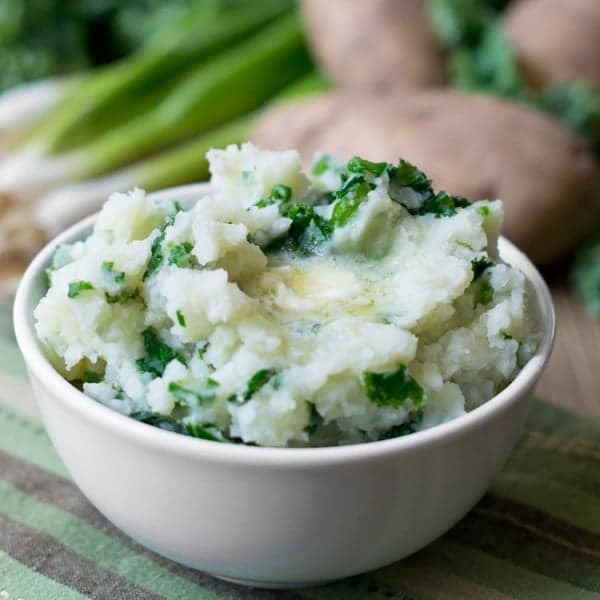 Colcannon is a mixture of mashed potatoes and sautéed kale or cabbage that exists as an excuse to eat butter. You see, there’s not just butter mashed into the potatoes. No, that’s not enough. 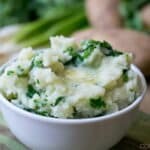 To serve colcannon you smear butter onto the top of each serving so that it melts into a golden puddle. When you eat it your goal is to get melted butter onto each spoonful. Now you understand why my son eats potatoes if I mix them with kale. 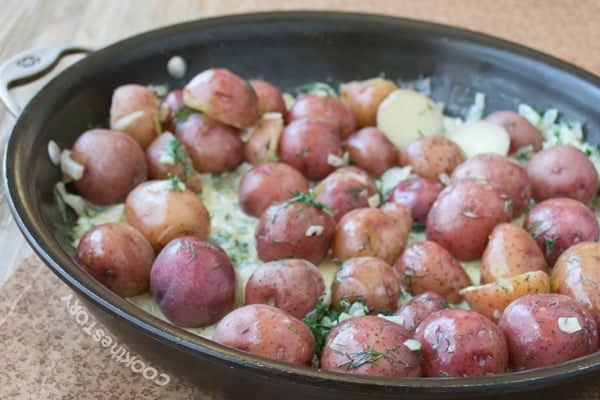 If you like this recipe, I think you’ll also love these Potatoes with Lots of Dill. Be sure to follow me on Facebook, Pinterest, Twitter and Instagram so that you catch all the new things coming out of my kitchen. 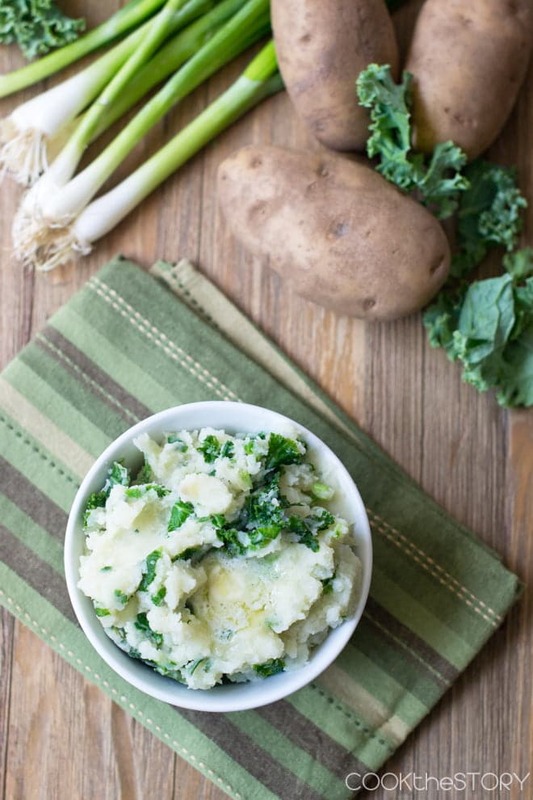 Colcannon is a buttery blend of potatoes and kale with a lot of butter. And then some more butter. Did I mention there's some butter going on here? It's a traditional Irish dish and is perfect for St. Patrick's Day (and any other time you need an excuse to eat butter). Peel the potatoes an cut them into 2 inch chunks. Put them in a large pot with 2 teaspoons of salt and enough cold water to cover them. Partially cover the pot and bring it to a boil over high heat. Remove cover and reduce heat to a simmer. Cook until potatoes are fork tender. Drain and leave them in the colander. Add the 2 tablespoons of butter to the pot and put it over medium heat until it melts. Add the kale and 1/2 teaspooon of salt. Use tongs to stir it until it is well-wilted, 3-4 minutes. Add the green onions and cook for 30 seconds more. Add the drained potatoes and mash them. Stir in 1/2 cup of milk. Taste. Add more milk to make it moister and more salt if desired. Transfer to soup bowls and dot each portion with a slice of cold butter.